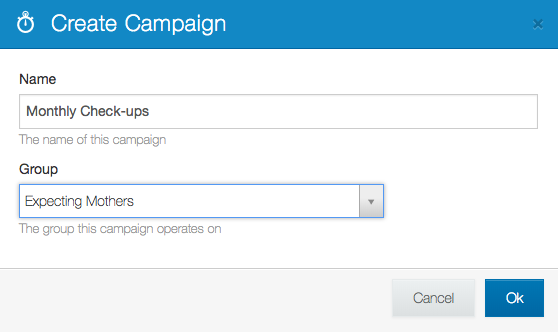 Campaigns allow you to schedule messages and workflows relative to a date for a contact, such as the date a contact was created or the date a contact joined a group. Campaigns are often used for DRIP communication such as maternity health reminders, therapy adherence messages, or messages that correspond with the lifecycle of a product or service. These monthly reminders are based on the date of each contact's creation. Not every contact will receive the messages at the same time. Rather, the messages are sent in relation to the date they were created. In the image above, we see that each contact will receive a message 4 weeks, 8 weeks, and 12 weeks after they were created. Note that this differs from scheduling a message to be sent later in that scheduled messages are sent to all contacts or groups at the same time. To create your first campaign, click here.